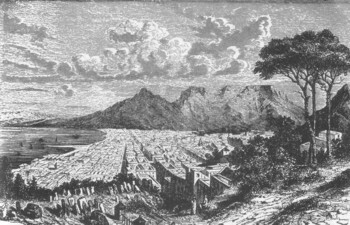 “Within fourteen days of their arrival,” wrote Renata Coetzee in The South African Culinary Tradition, “these early settlers had laid out a vegetable garden.” They planted sweet potatoes, pineapples, watermelons, pumpkins, cucumbers, radishes, and citrus trees such as lemons and oranges. Among the Malaysian spices transferred by the slaves to South Africa were anise seed, fennel, turmeric, ginger, cardamom, cumin, coriander, mustard seed, tamarind, and garlic. Chiles, of course, were introduced by the Portuguese traders and eventually were disseminated across Africa by birds. Curiously, coconuts–so important in the Spice Islands–do not play a role in South African curries.Late in the seventeenth century, with the “revictualling” station in operation, commerce between the Dutch East India Company and the new Dutch colony of South Africa picked up considerably because of an important commodity: Malay slaves, referred to in South African literature as “the king of slaves.” The men were utilized as farmers, carpenters, musicians, tailors, and fishermen, while the women were expert cooks who not only introduced exotic Spice Islands dishes, but also imported the spices necessary to prepare them. Generally speaking, Cape Malay curries usually contain meat and are not as highly spiced with chiles as their Asiatic cousins. Onions and tomatoes are added to achieve a truly thick curry, and sometimes potatoes are placed in the curry for extra body. The Malay curries–usually eaten with the fingers–are a meal in themselves. They are eaten with rice and roti bread as accompaniments and are served with salads, sambals, pickles, and chutneys. 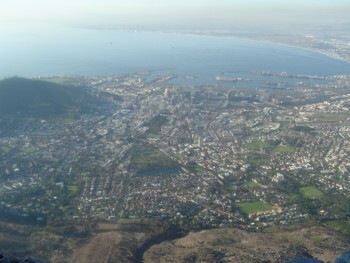 The Cape Malays, however, were just one of the curry influences on South Africa. The first shipment of indentured Indian laborers arrived in Natal, in the eastern part of the country, on November 16, 1860, to work on the sugar plantations. Within six years, about five thousand Indians were working in Natal, and of course, they brought their Indian curry traditions with them. It seems that the British taste for curries had waned somewhat as the pioneers ventured further from Cape Town. The indentured laborers used a spice mix called mussala (an obvious corruption of masala), which is the simplest form of curry powder in South Africa, but its basic ingredients vary considerably. One version contains just turmeric, cumin, and red chile powder, while another is composed of equal amounts of fennel, coriander, cinnamon, and cumin. Curries are universally loved in South Africa and they cross cultural and racial barriers. 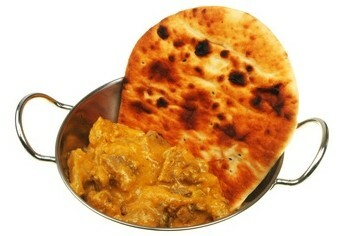 In describing the curries of Natal, Laurens Van der Post made a sort of culinary appeal to free South Africa: “Curry in all the forms in which it is done in India is served in hotels and homes and eaten with relish,” he wrote, “however strong the colour prejudice of the household in which they are served. If only the heart in South Africa could be governed for a year or two by the national palate, there would be no apartheid or racial prejudice left in the land, because our cooking is the best advertisement the world could possibly offer for a multi-racial society, free of religious, racial, and other forms of discrimination.” Fortunately, much has changed in South Africa since he made that comment. 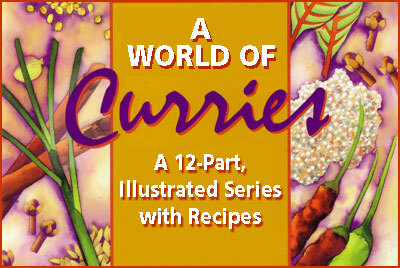 In East Africa, the curry influences came from many sources. The earliest date to the third century B.C., when the region was, for a brief time, one of the first colonies of the Indian kingdoms. Also, the region’s proximity to the Middle East led to the familiarity with spice mixtures such as baharat from the Arabian Gulf States and zhug, from Yemen. Arab traders had virtual control of the region–especially the coast–for a thousand years, while trading in spices and slaves. Around A.D. 1000, the island of Zanzibar, now part of Tanzania, was settled by African mainlanders, but the island soon hosted traders from Iran, India, and Arabia. 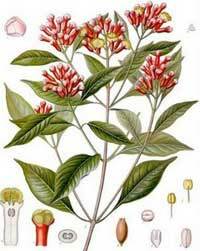 With these traders arrived spices–in particular, cloves, which grew very well on the island. Later visits by the Portuguese and Dutch to Zanzibar secured its place in spice-growing history. Because of the Dutch destruction of the clove trees in the Moluccas, new clove-growing regions were needed, and Zanzibar was perfect. Today, the “Isle of Cloves” grows eighty percent of the world’s supply, and the populace takes clove-growing seriously indeed. The large number of Indians, of course, resulted from the same influx of indentured laborers that flooded South Africa. Many of the Indians who settled in East Africa were Muslims from the Bombay area who arrived in the region during the early days of British rule to build the railroad that runs from Mombasa on the coast of Kenya to Kampala, Uganda. Christians from Goa also arrived to work as teachers and clerks. Tanzanians are fond of currying goat or chicken in a stew, or simply charcoal-broiling the meats after they have been marinated in a mixture of curry spices and chiles. 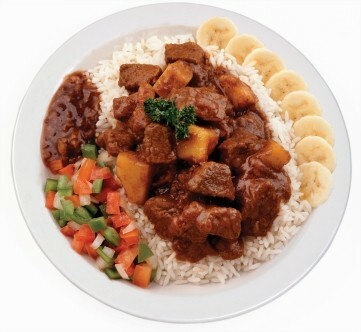 In Kenya, a stew called kima is served, combining chopped beef with red chile powder and curry spices. It is obviously derived from the keema, or mincemeat curries of India. The weekend curry lunch, a holdover from British colonial days, was still observed in some parts of East Africa well into the 1970s. Curries are also important in the cookery of Mozambique, despite its history as a Portuguese colony. Its proximity to Natal in South Africa is probably the reason. Sometimes cashew nuts, a major crop in Mozambique, are added to their curries, much like candelnuts are added to Malaysian curries. Mozambique cooks are known for a chile paste that’s almost a curry paste. Piri piri, made with the narrow, fiery African chiles of the same name, contains garlic, herbs, and oil too–but no curry spices. It is, however, analagous to curries in the native cuisine of East Africa, the food not influenced by Arabs, Indians, and the British. Curries abound in Malawi, which became the British protectorate of Nyasaland in 1891. Local cookbooks have recipes for specific curry powders for meats, fish, and vegetables, and a few universal powders containing–as is typical for East Africa–a large helping of chiles. Even the butter is curried in Ethiopia, with ginger, garlic, turmeric, basil, cardamom, and other spices combined to make a ghee-like concoction known as nit’ir qibe, or Ethiopian Curried Butter. But the most important spice mixture is a condiment called berbere, which is made with the hottest chiles available, plus other spices, and is served as a side dish with meat, used as a coating for drying meats, or is a major ingredient of curried meats. 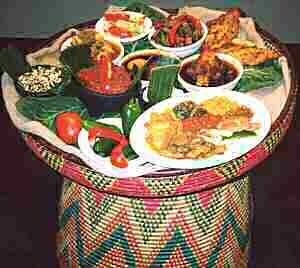 Tribal custom dictated that berbere be served with kifto, a raw meat dish that is served warm. According to legend, the more delicious a woman’s berbere was, the better chance she had to win a husband. Recipes for berbere were closely guarded, as the marriageability of women was at stake. My berbere recipe is not as hot as some versions, which require up to several cups of powdered cayennes or piripiris! Chile peppers are obviously extremely important in Ethiopian curries, and they have even inspired a derogatory expression, ye wend alich’a, meaning a man who has no pepper in him. In Ethiopian cookery, berbere is an indispensable ingredient in the “national dishes” known as wat, or w’et (depending on the transliteration) which are spicy, curry-like stews of lamb, beef, chicken, beans, or vegetables (never pork). Nowadays, Ethiopian cuisine is no longer a secret, considering the fact that about seventy Ethiopian restaurants that have opened in a number of North American cities during the past two decades. Since Africa was one of the few major curry regions I was unable to visit personally, I did the next best thing and dined years ago at an Ethiopian restaurant in New York City, the Blue Nile on West 77th Street. Mary Jane and I tried several variations on w’et (stews) at the Blue Nile that included such ingredients as fennel and cardamom seeds, ginger, garlic, red chiles and cloves. The four w’ets were placed on a wide tray covered with injera, a sourdough, pancake-like bread made from t’ef, a cereal grain also called lovegrass. (But it can also be made with barley, corn, wheat, or millet.) As is the tradition of communal eating with fingers rather than forks, we tore off a corner of t’ef, using right hand only, and used the spongy bread to pinch some of the w’et and transfer it to the mouth. This blend is the hottest curry powder I found from Africa, although some pastes like harissa and berbere might top it on the heat scale. 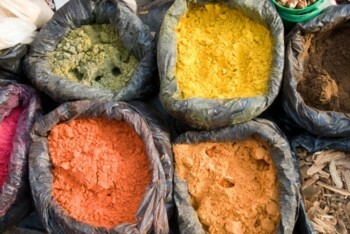 Traditionally in Malawi, the spices are sun-dried before being ground and are not toasted. Note the large amount of cloves in this recipe, which is a probable influence from Zanzibar, a clove-growing island. 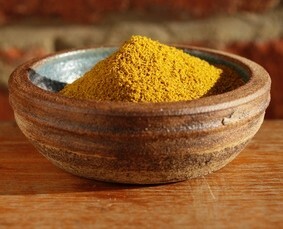 Combine all ingredients in a spice mill and process to a fine powder. Originally used as the sauce for kifto, fresh raw meat dishes, berbere is now used as both an ingredient and a condiment in Ethiopian cooking. Like harissa, it is essentially a curry paste with an abundance of red chiles. Obviously, to tone this down, use fewer chiles. 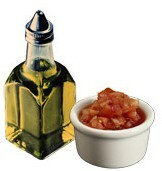 Serve sparingly as a condiment with grilled meats and poultry or add to soups and stews. This paste will keep for a couple of months under refrigeration. Toast the cardamon, cumin, coriander, cinnamon, peppercorns, and fenugreek in a hot skillet, shaking constantly, for a couple of minutes, until they start to toast and gain aroma. Grind these spices to form a powder. Combine the onions, garlic, and 1/2 cup water in a blender or food processor and puree until smooth. Add the roasted spice powder, piquins, cayenne, paprika, ginger, allspice, nutmeg, and cloves and continue to blend. Slowly add the remaining 1/2 cup water, wine, and oil and blend until smooth. Simmer the sauce for 15 minutes to blend the flavors and thicken. Known as nit’ir qibe, this interesting butter-oil is a basic ingredient in the preparation of traditional Ethiopian foods. It is also great spread on toasted breads of any kind. Combine the ginger, onion, and garlic and pound to a coarse paste in a mortar. Set aside. 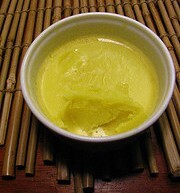 Melt the butter over low heat, stirring constantly, taking care that the butter does not darken. Skim off the foam as it rises, and continue cooking until all the foam is gone. Add the paste and the remaining ingredients and simmer, uncovered, at the lowest possible heat, stirring occasionally, for 30 minutes. Remove from the heat and allow to cool. Pour off the transparent top layer, leaving as much of the milk solids and spices as possible. Strain the top layer through several layers of cheesecloth. The butter will usually be an oil at room temperature and solidify in the refrigerator, where it can be kept, covered, for 3 or 4 months. 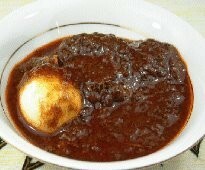 The most well known of the “National Dishes” of Ethopia is doro w’et, or chicken stew. This dish is traditionally served over injera, a sour-dough bread. Remove the skin and score the chicken so that sauce will penetrate the meat. Rub the chicken with the lemon juice and let it marinate for 30 minutes at room temperature. Saute the onion and garlic in the oil until browned. Add the berbere, paprika, and spices and saute for 2 to 3 minutes. Add the chicken to the pan and toss to coat. Stir in enough water to form a thick sauce. Bring to a boil, reduce the heat, cover, and simmer for 30 minutes or until the meat starts to fall off the bone. Using a fork, poke holes all over the eggs, then add them to the stew. Cover again and simmer for an additional 15 minutes. This Tanzanian specialty has the tantalizing aroma of cloves in addition to the curry spices. Make certain that you select green bananas for this dish, or your curry will be overly mushy. Chicken may be substituted for the beef and the cooking time reduced to a total of 40 minutes. Heat the oil in a skillet and saute the onion until it is light brown, about 5 minutes. Add the steak and saute for 1 minute, then add the chiles, salt, curry powder, and cloves. Saute for 10 minutes, stirring constantly. Add the tomatoes and the water and simmer, uncovered for 40 minutes, stirring occasionally. The sauce should be reduced considerably. Add the bananas and cook until the both the meat and bananas are tender, 20 minutes or more. Serve with white rice, sliced tomatoes, and other curry condiments. Perhaps the all time favorite South African curry, Pinang-Kerrie is a Cape Malay dish that should be served fairly dry. Some versions substitute lemon juice for the tamarind paste. Serve it with your favorite rice from Part 12. Note: This recipe requires advance preparation. Combine the garlic, salt, turmeric, curry powder, orange leaves, ginger, vinegar, tamarind paste or lemon juice, and sugar to make a marinade. Toss the lamb in the marinade and allow to sit for at least 2 hours. Heat the oil in a skillet and saute the onions until they are golden, about 10 minutes. Add the lamb and water and cook over low heat, uncovered, for about 45 minutes, or until the lamb is tender. The sauce should be very thick, almost dry. Remove the bay leaves before serving.